Interested in language and culture? Explore the possibilities! 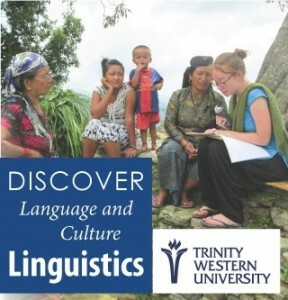 Linguistics courses fulfill elective credit requirements for a number of TWU degree programs. As the Linguistics Department at TWU, CanIL (Canada Institute of Linguistics) provides cross-cultural and linguistics classes. This understanding of language and culture will broaden your worldview and better equip you for various contexts in an increasingly global community. Check with your advisor and program worksheet to see if this is an option that you can pursue. Eligibility: Undeclared or non-linguistics majors at TWU. Note that TWU Torch Award recipients are not eligible and that Linguistics majors or minors can apply for regular CanIL financial aid. Amount: $500 per eligible linguistics course! Deadlines: Apply by July 15 for Fall semester, November 15 for Spring semester, April 15 for Summer semester. An introduction to the primary elements of linguistics, including an introduction to morphology and semantics (words and meaning), phonetics (the sounds of language), phonology (the sound systems of language), syntax (grammatical systems), sociolinguistics, psycholinguistics, language acquisition theory, and current issues in linguistics. No previous knowledge of linguistics is required.